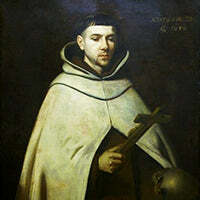 St. John of the Cross was a major figure of the Counter-Reformation, a Spanish mystic, a Roman Catholic saint, a Carmelite friar and a priest who was born at Fontiveros, Old Castile. John of the Cross is known for his writings. Both his poetry and his studies on the growth of the soul are considered the summit of mystical Spanish literature and one of the peaks of all Spanish literature. He was canonized as a saint in 1726 by Pope Benedict XIII. He is one of the thirty-six Doctors of the Church.